Every color has a pure form that boggles the mind and goes beyond the eyes ability to see and it and the brain’s ability to interpret it. I’m talking about hues of color that make your neurons tingle as they try to absorb its hues. You may think of the dark red of a fine ruby or the electric-green of a buggy-eyed tree frog in a rain forest. These pure colors attract us like flies to honey and are a primary reason that thousands of visitors take the risk of stepping into the Mendenhall Glacier to see its sculpted walls of cerulean blue ice. The ice of the cave walls and ceiling is shaped into waves by the wind and water. Immense pressure from hundreds of feet of ice above compress the ice into perfect clarity giving a view to the conditions within. Glaciers carry the earth in their walls and as they melt create new land. As I stepped into Mendenhall Glacier, the world trapped within was immediately evident. Far into the ice, large boulders and sheets of sediment could be seen within. The rocks were distorted by the curves of the ice face. At the base of the cave’s walls, ice flowed over rocks that were half in and half out of their century-old entrapment. The whole floor of the glacier was made from the boulders that melted from glacier. These boulders, it seems, are released at a rapid rate, as the glacier was much different than my last visit in 2015. Mendenhall Glacier is receding up to 150 feet per year. The rapid rate of change was in full display. I was astounded to see former site of the ice caves that I visited in 2015 was ice free. In its place, was a valley of rocks and a frozen river. Rock walls extended up to the ice face high above us. Although I cannot be sure how far the ice receded, it may have receded as much as 300 feet. This is not the first time I have seen such change in an Alaskan glacier – I was reminded of the demise of the ices caves of Castner Glacier over the course of a couple years. Glacial change can happen at a rapid pace! The images below capture the glacier as it is now – I look forward to documenting its inevitable change in the future. The mountains rise above Mendenhall Glacier. The expansive Mendenhall Glacier covers Mendenhall Lake. A fissure in the glacier reveals a brilliant blue. Waves of ice carved into the ceiling and walls of Mendenhall Glacier. A ridge of ice shaped by wind and rain. A large boulder released from the ice and lit the mouth of the cave. Sediment trapped in the ice and warped by its curves. A rock escapes the ice in the ceiling of the ice caves. A close-up of the icy curves in Mendenhall Glacier. A tunnel of ice leading to another chamber of the ice cave. Can you find the person in this image??! The ice of Mendenhall glacier dwarfs them in the lower left corner. Shadows of the sunrise flow over Mendenhall Glacier’s face. You are sitting on a warm, tropical, beach drinking a margarita. As you watch the day wane away the sun dips lower on the ocean horizon, and the landscape transforms into brilliant oranges and purples. Behind you the palm trees are bathed in orange, and the landscape has taken on incredible colors with accentuated shadows of even the shortest plant or sandcastle. Almost certainly you bring out your cell phone or camera, because, like all photographers, you find the beauty of the Golden Hour to be irresistible, and you know the peak experience will be short lived. Perhaps you even think to yourself that you wish the beauty of that light could last forever. What if it could? The Golden Hour is also called the “magic hour” and for a landscape photographer there is no better time to be outside. The terms refer to the period of time when the sun is 6 degrees or less from the horizon. In many regions, like the balmy beach scene above, the moment as the sun sweeps through that 6 degree sweet-spot is relatively short. However, in Polar regions like Alaska, the winter sun has such as a low, southern trajectory, that the sunset-like colors almost never fade. There are a variety of tools, apps, and websites to calculate the solar angle at your location. I used the NOAA ESRL Sun Position Calculator to determine that in Fairbanks the sun dips to the 6 degree mark on October 24th, 2015 and will remain below 6 degrees until February 26th, 2016. To illustrate the effect of the polar magic hour the images below showcase the colors, and shadows achieved by the low-lying sun. For 3 months, the silver lining of our short, winter days is a luxurious landscape lit by an eternal Golden Hour. Golden Hour Sunset at the University of Alaska, Fairbanks. The golden hour casts long shadow, even filling in these fox tracks. The light of the Golden Hour turns the landscapes into shades of pink, red, and orange. Long shadows casts by the low sun. The light of the golden hour pouring through a valley at Angel Rocks, Alaska. The beginning of the Golden Hour reflecting off the trees and a tributary to the Chena River. Subtle shades of pink during the Golden Hour. Shades of pink and orange during the eternal Golden Hour of the Arctic. Magic lighting and sunset from Angel Rocks, Alaska. Beautiful light off the peaks and snowdrifts. Because unique light of the Golden Hour, it offers the perfect opportunity for black and white transformations. Do you prefer the full color or black and white image? “August in Minnesota” has a connotation to it for those who have lived here long enough. Hot, sticky, humid days boost electricity bills as air-conditioners stay on full time to beat the heat. A result of the moist conditions is heavily dewed grass in the mornings. I stepped outside and thick fog hung in the air. It was 7:00 AM, and the sun was beginning to burn through the mist with some filtered reds and oranges. A large moon hung high in the sky, and my truck passed under it on my way to our land in Butler, Minnesota. Pulling up, I unlocked the gate and pushed it open. 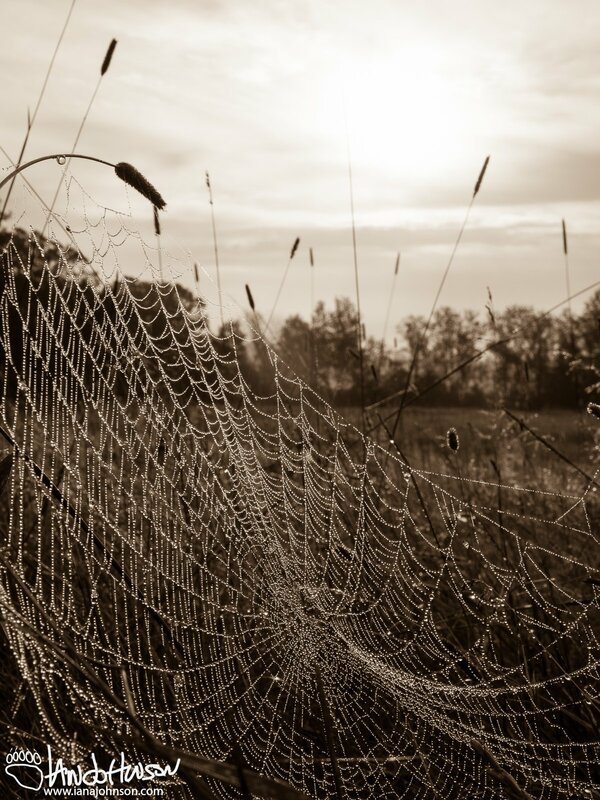 Dew hung heavy on the grass and bejeweled thousands of spider webs across the 30 acre pasture. In a few moments I had my camera in hand as I passed through the knee high grass. Many of us have a location that we’ve visited many times, and a stop there brings back many important memories for us. For these spots, there are peak experiences when conditions or moments are at their best. This sweaty, August morning was one of those for me. 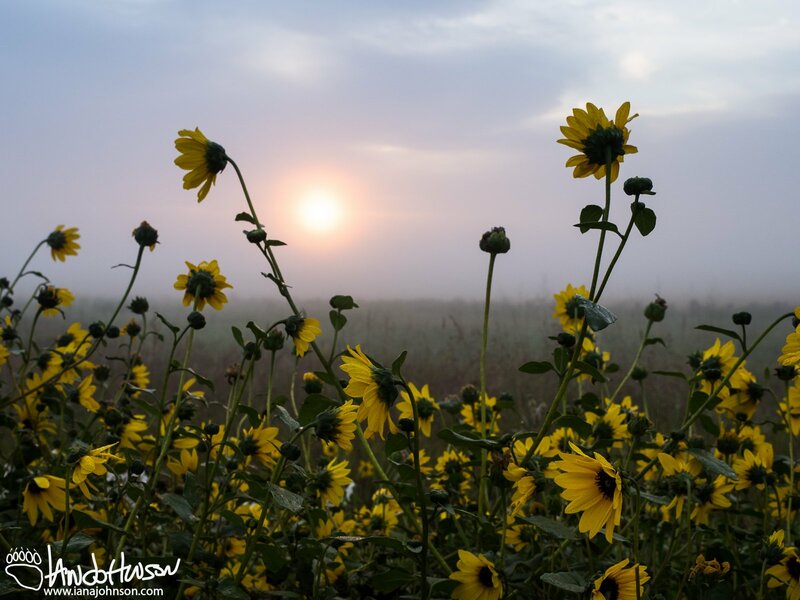 The foggy sunrise catalyzed the transformation of the scene from dewy, shadowed pasture to a hot, new day. As it did so I tried to capture the beauty of the morning dew on the webs and flowers that it encrusted in shiny droplets. Some of the spider webs had drops so large and heavy that they reflected the world over-and-over while dragging their grass pylons down around them with their collective weight. I feared a slight wind would cause them to drop off before I was done. The sun rose higher and I turned my meandering around; I was headed south but turned to heading north. I passed along the edge of the grassland and sank below a small rise. As I came over the top hill my eye caught movement and then the body of a deer. The deer (Odocoileus virginianus) was a small fawn accompanied by its mother. Somehow I had caught the attention of the fawn only, and the mother continued to graze. His curiosity got them best of him, and he started to walk towards to me. I stood post-like with camera clicking. By the time the fawn was satisfied that something wasn’t-quite-right he stood 10 yards away. The mother had moved silently up the hill and stood about 20 yards away to contemplate me too. Finally she stomped a foot, snorted, and brought her offspring into the shelter of the woods. My conclusion to you is this : every day is a new day, and you can only go enjoy what you go to see. If you have a favorite spot, I challenge you to go experience that location when it is at its best. 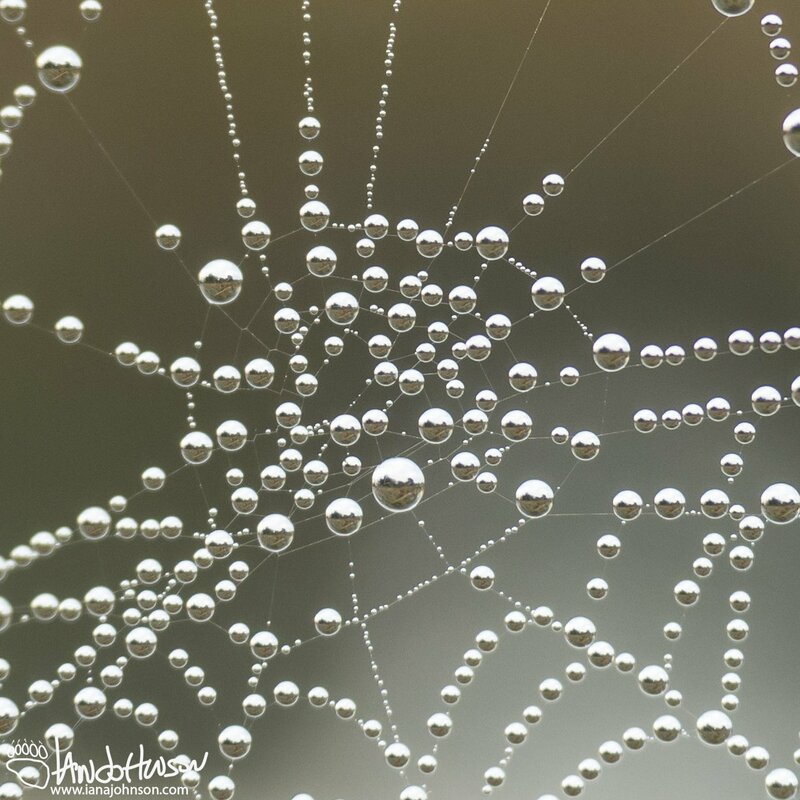 The large dew drops on this spider web performed the function of thousands of magnifying glasses. Each water drop magnified within itself the unfolding sunrise beyond. The collected dew on this spider was was so heavy that the grass bent under its weight. Already the sun was high in the sky and drying the landscape out. 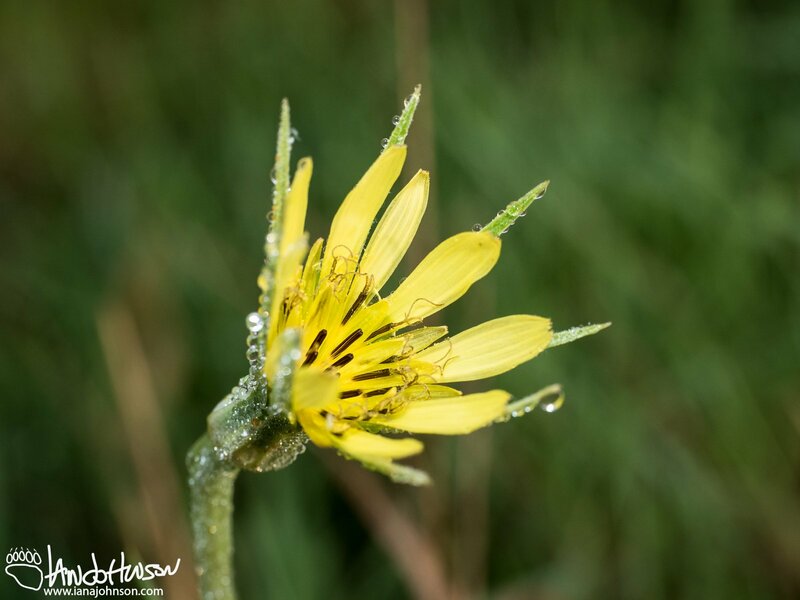 A Meadow Goat’s Beard (Tragopogon pratensis) holds on to dew drops in the morning. 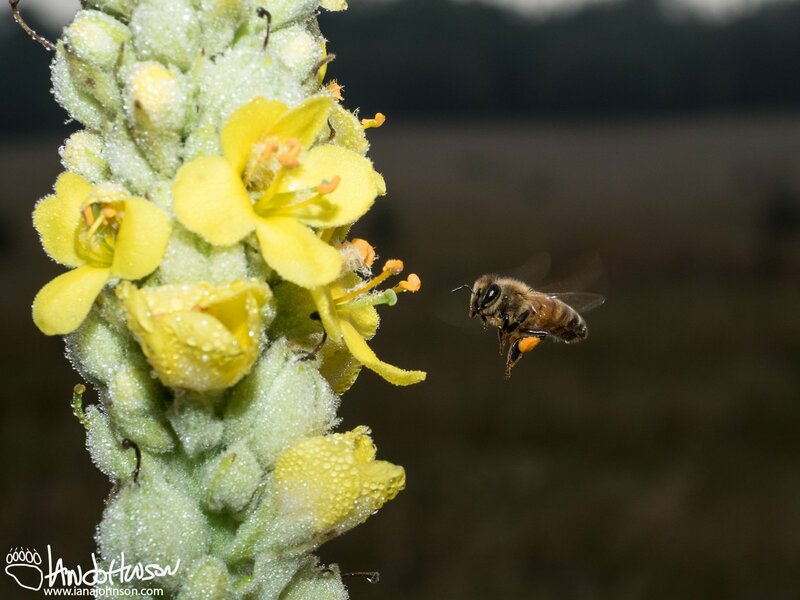 A honey bee flies up to sip on the nectar of mullen (Verbascum thapsus) flowers. The honey bees on our land are a great asset for pollination! 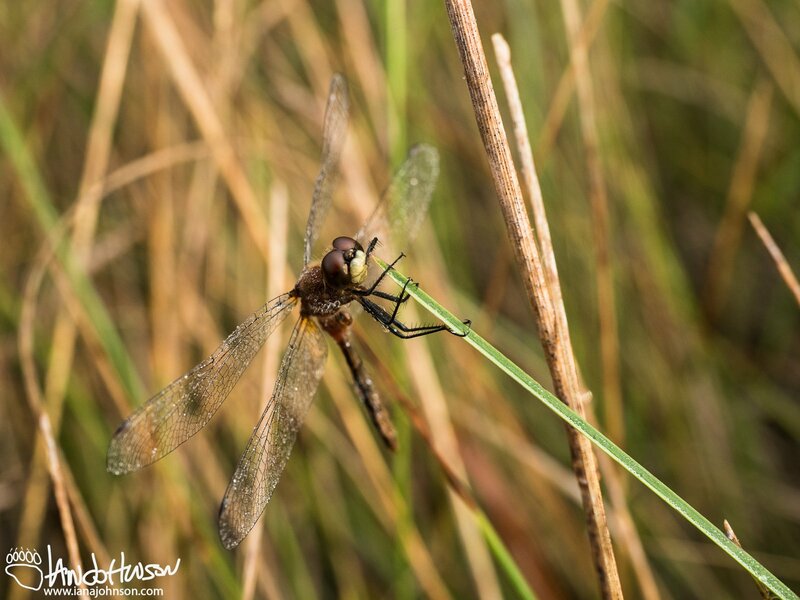 This dragonfly was too cold and wet to escape, so he perched waiting for the sun’s warmth. 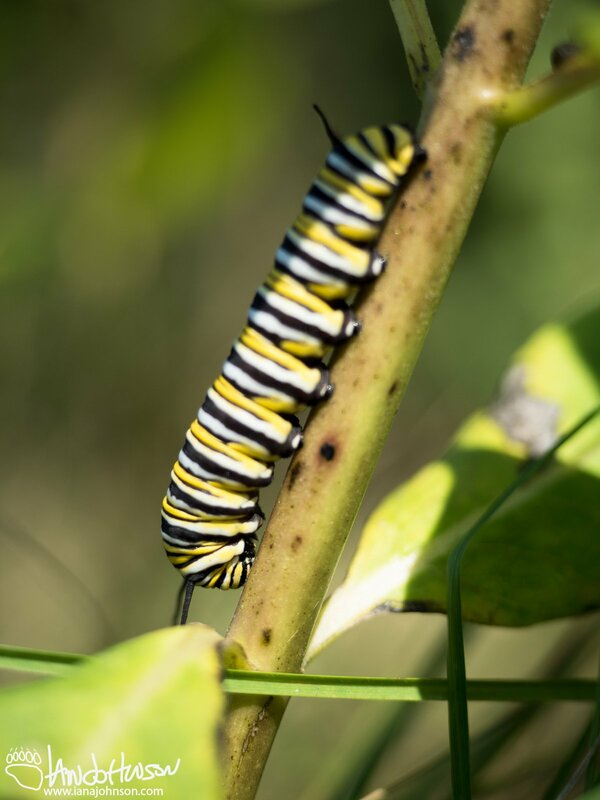 A monarch caterpillar clings on to a milkweed. 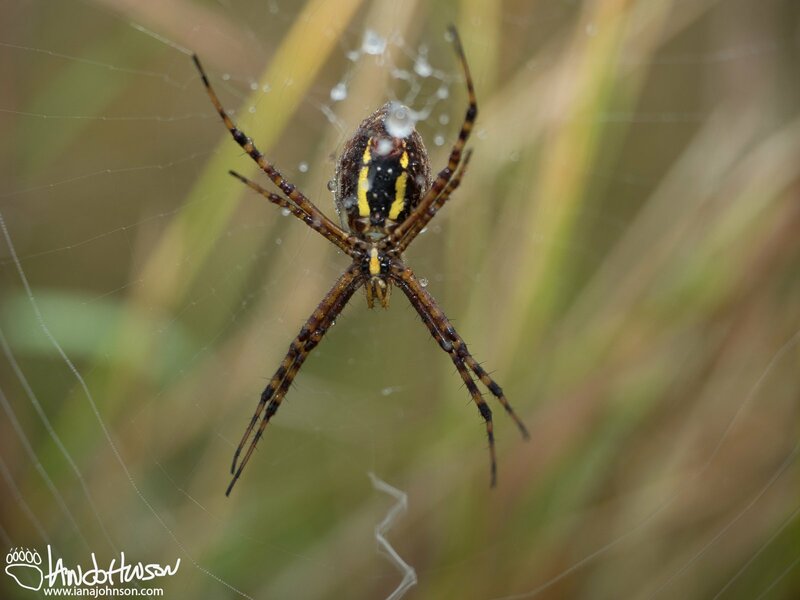 These orb weaver spiders were very common in the pasture. Although I did not capture it in this image, they weave an incredible zig-zag patterns into their web called a stabilimentum. The patterns reflect UV light and are thought to attract prey. A young white-tailed deer steps forward to get a look at me. Unable to quite decided if I was dangerous or not. The mother of the young buck scopes me out after being alerted by her offspring. This young white-tailed deer buck ended up within 10 yards from me in his quest to figure out what I was. The white-tailed fawn is scouting me out here from about 18 yards away. Getting a bit closer! This white tailed deer comes forward to check on me.